This is the fifteenth in a series of guests posts that feature Archtober Building of the Day tours! Today’s Building of the Day introduced us to the world of urban farming at the Edible School Yard, located at PS7 in East Harlem. As WORKac’s Sam Dufaux explained, the project began with their winning submission for MoMA PS1’s Young Architects Project six years ago. 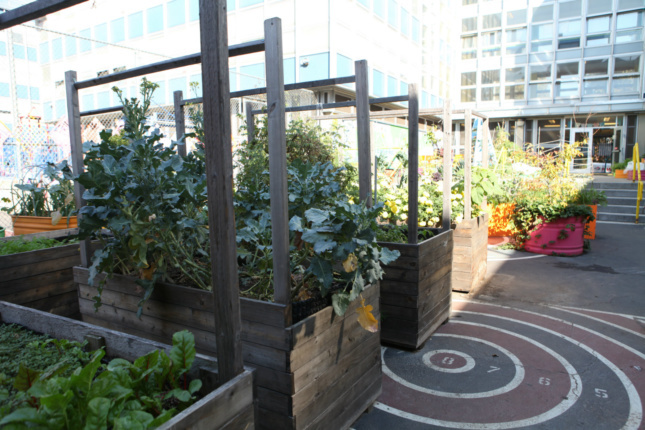 WORKac’s temporary installation, P.F.1 (Public Farm One), was a sustainable, urban garden constructed out of large, cardboard tubes. 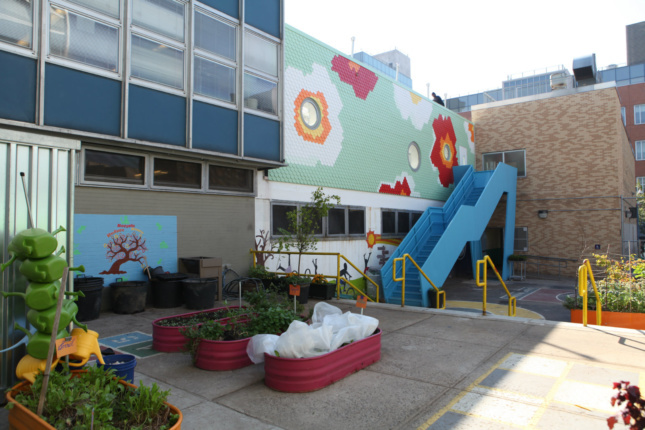 This project caught the attention of Edible School Yard NYC, who approached WORKac to install these urban gardens in various public schools throughout the city. 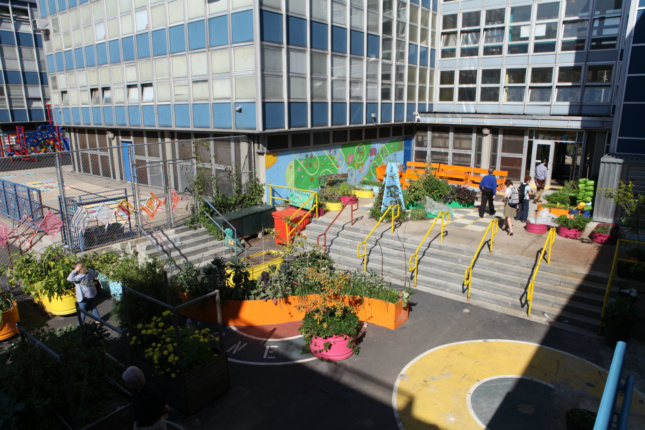 Edible School Yard’s Annette Slonim and Miram Villamel explained that gardens are placed in schools that tend to have higher obesity rates and that are inside food deserts (i.e. neighborhoods lacking nearby grocery stores or fruit stands). 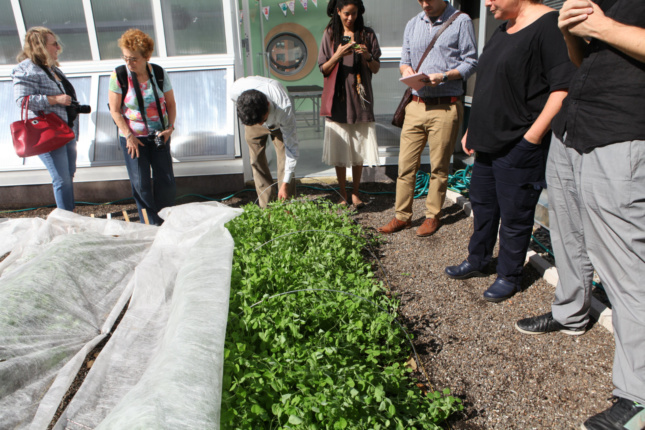 The students plant, grow, harvest, and ultimately cook the vegetables grown in the gardens, thereby helping them understand what processes go into producing the food they eat. In order to make this idea a reality, PS7 needed a garden, a greenhouse, and a kitchen classroom. WORKac began by customizing planters to go in the school’s courtyard so students could grow fruits and vegetables while the school’s greenhouse was being constructed on top of the existing cafeteria. They decided to build the greenhouse on top of the existing cafeteria, which allowed WORKac to build a rooftop garden behind the greenhouse. The greenhouse can accommodate 15 to 35 students and includes benches, growing tables, heaters to help keep it warm in the winter, and fans to circulate air. 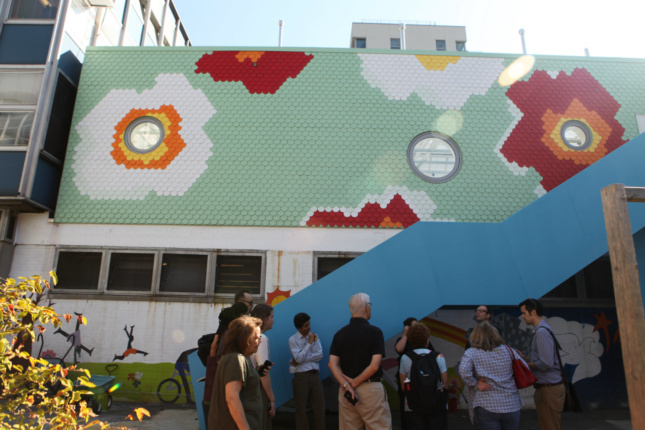 The entire structure was custom built using (mainly) standardized parts and its facade is constructed of painted cement shingles arranged in a pixilated pattern to form the shapes of flowers. As Dufaux explained, this was an easy way to bring color and an identity to the Edible School Yard project. Behind the greenhouse, a garage door opens to reveal the rooftop garden, a feature that proved challenging, as it had to be light enough to go on top of the cafeteria while still providing enough soil to allow plants to grow. To accomplish this, WORKac had to reinforce the entire cafeteria structure, from the concrete slabs down to the foundation itself. The garden’s substrate is commonly used on green roofs, including the garden atop Brooklyn Grange. The school also makes its own compost. Villamel showed us the plants the school is currently growing up there—hearty greens that do well in the winter—and encouraged us to taste them. I can attest that they were quite delicious. Attached to the greenhouse, WORKac converted a regular classroom into a kitchen classroom. 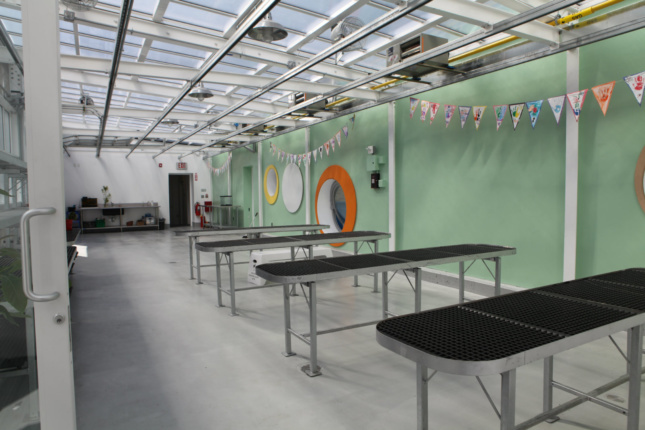 The space, designed to look like a kitchen in a student’s home, was a unique challenge for WORKac and the NYC Department of Education, which normally builds commercial kitchens in their schools. WORKac had to get a variance for many of its design features. Inside, we saw the utensils, bowls, and prep materials to be used in an upcoming class. Villamel and Slonim noted that the kitchen classroom is customized to include foods the students of the area might typically eat at home. 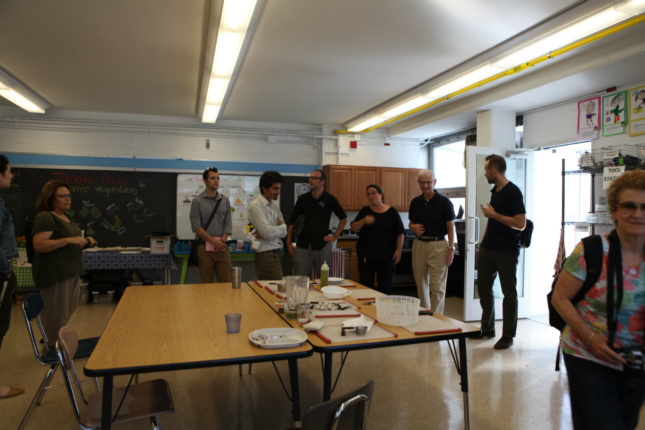 WORKac and Edible School Yard NYC have come together to provide the students of PS7 a one-of–a-kind learning experience in a one-of-a-kind learning environment. Tomorrow, we venture to St. Patrick’s Cathedral! About the author: Jacob Fredi is the Public Programs and Exhibitions Coordinator at the Center for Architecture. When he’s not on Building of the Day tours, you can find him playing board games (Dominion!) and brewing his own beer.